Each ticket includes a 2 hour donut and coffee sampling(9am-11am), commemorative mug with access to live music, people’s choice judging, barista art competition and several children themed activities. Limited space available. Price goes up at gate. For Children ages 4 - 15, includes a 2 hour donut sampling(9am-11am) with access to live music, people’s choice judging, barista art competition and several children themed activities. Limited space available. Price goes up at gate. Each ticket includes a 2 hour donut and coffee sampling, commemorative mug with access to live music, people’s choice judging, barista art competition and several children themed activities. Limited space available. Price goes up at gate. For Children ages 4 - 15, includes a 2 hour donut and coffee sampling(11am-1pm) with access to live music, people’s choice judging, barista art competition and several children themed activities. Limited space available. Price goes up at gate. 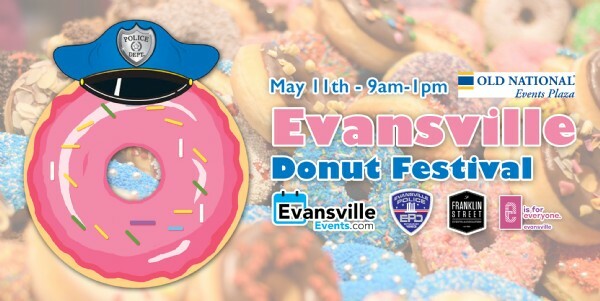 Evansville Donut Festival is coming to the Old National Events Plaza’s Exhibit Hall on Saturday, May 11th from 9am until 1pm. After an amazing kick-off year, we wanted to send our sincere thanks for supporting our event. We were able to raise nearly $10,000 to split between the fundraising efforts of Mickey's Kingdom Playground and Stoplight City Playground. Now that Mickey's Kingdom has been built, we are focusing our efforts towards Stoplight City and the Trolley Playground piece. -BARISTA Art THROW-DOWN hosted by the Evansville Barista Coalition. -Art, Face Painting, Games and Donut Themed Activities. VENDOR & SPONSOR interests please email info@evansvilleevents.com for more details.